Telobal Provide Virtual Numbers (DIDs) from all of the world. 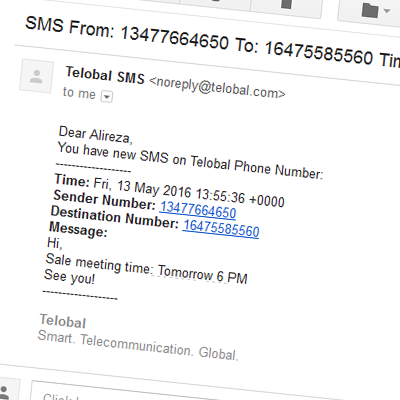 also for some area, Telobal Provide Mobile Number Virtual Number. By Telobal free PBX and VOiP you can outbound call from your Number. SMS will be receive and forward to your E-Mail immediately. Telobal Receive SMS is a free service! In general, the behavior of sites and apps for accepting mobile numbers and sending SMS to it is not commitment by Telobal, because they may not have a contract with your country's telecom companies. Although text messaging may take place, our commitment is to receive text messages from mobile phones in the same country. * It is worth noting that there is no possibility to provide Sending SMS service. a* The mobile number of UK is accepted in the Telegram and WhatsApp, but may not be accept for the registration of Google services. b* The mobile number of Ukraine is accepted in Telegram, WhatsApp and GMail. c* The Netherlands mobile number is confirmed on the telegram, but on other sites (following the user experience) may not be accept. d* Australia and Russian Mobile need Registration Requirements for activation. Other countries mobiles not need Registration Requirements. e* Canada does not have the mobile numbers prefix and the Canada cities numbers provide in Telobal is "landline (Voip) numbers with support receiving SMS" and act like mobile numbers and sites and applications maybe accept or not as mobile.